In 1942, Glenn Miller, America’s #1 bandleader, voluntarily disbanded his world famous orchestra to offer his services to Uncle Sam. Within months he was assembling an even greater outfit, drawn from the very best of America’s musicians now being drafted into military service. To a larger than normal dance band he added a French horn and 21 strings to create an innovatory concert orchestra of majestic proportions, with a repertoire to match. It is this magnificent orchestra - Glenn’s ultimate achievement - that can be heard on this CD. As a service band it went through several name changes, including the Army Air Forces Training Command Orchestra and the American Band of the Supreme Allied Command, according to its mission and location. 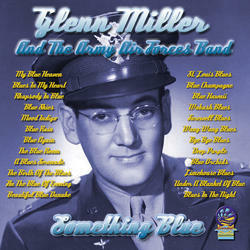 But, for British and American military personnel serving in the European Theatre of Operations (ETO) in 1944-5, it will always be remembered as Glenn Miller’s American Band of the Allied Expeditionary Forces (AEF) or, today, worldwide, simply as the Glenn Miller Army Air Force Band.